In April 2017 the University of Victoria Alumni Association published a post called “YouTunes” that talked about students’ musical memories from their time at UVic. It’s a fun post to read if you love music and the memories certain songs and bands hold. It got me thinking about the ’90s again, which is the era when I attended UVic. I often think of the ’90s with fondness, and most of the music I listen to is from that decade. It isn’t that life was necessarily easier back then. But there was a certain excitement and freedom about being a student with an unwritten future still ahead of me. And there was a certain comfort in the familiar routine of school. So we piled in a car and headed down to Dallas Road. 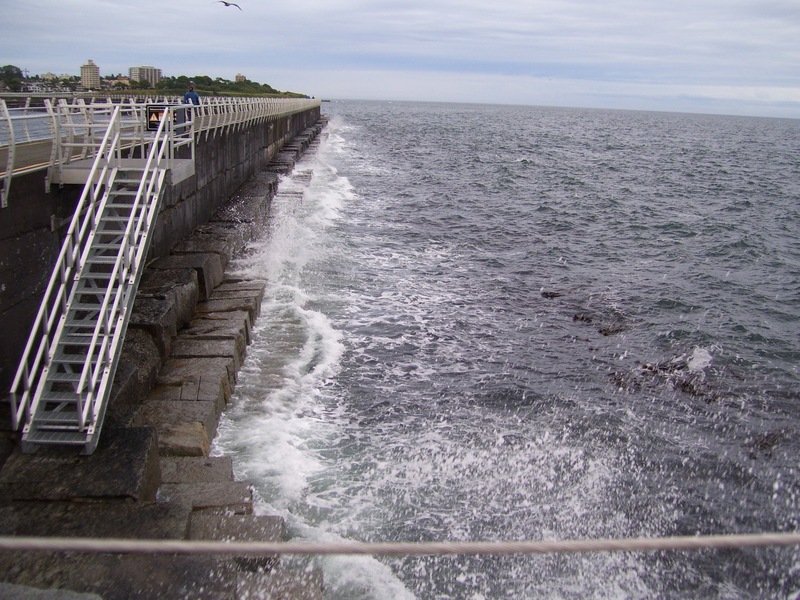 I didn’t know much about the breakwater back then, except that it was a narrow concrete path that stretched out into the ocean and gave me a bit of vertigo, so it was therefore an exciting place to be! According to the Greater Victoria Harbour Authority, the concrete breakwater is 762 metres long, a nice long healthy walk in the sea air. As it celebrates its 100th birthday in 2017, it continues to be as popular as ever with tourists and Victoria residents alike. Handrails weren’t added until 2013, so back in the ’90s we felt very daring as we headed down the narrow path with a steep drop and ocean waves lapping on either side. I remember it being a blustery evening, and as we reached the very end of the breakwater, we stretched our arms out and leaned into the wind. Nowadays, with the handrails, the Ogden Point Breakwater is a fantastic walking trail for people of all ages. I was recently looking at the Victoria Trails website, and it gives a great overview and tips for safely exploring the area. According to this guide, it will take you half an hour to walk to the end of the breakwater and back. You can bring dogs as long as they’re on a leash. On the sides of the breakwater you can also see Na’Tsa’Maht – the Unity Wall Mural, showcasing the art of the Coast Salish Nations. So although my memory of that windy evening in the ’90s will always be precious to me, I think I enjoy this beautiful Victoria attraction even more now with its new vibrancy and accessibility. With the handrails, you don’t have to worry as much about the steep drop at the sides, and your eyes can open to the beauty of the area. August sunsets are particularly glorious.